A Roman tomb dating from the first to the third century has been discovered in the grounds of the Medical University in Bulgaria’s second city Plovdiv. According to archaeologists, the tomb was in the western necropolis of Philippopolis, the Roman-era name for Plovdiv. The find was discovered during the repair of the steam installation in the medical facility. The Roman tomb is made of bricks, bonded with mortar, and the roof is a monolithic granite slab. According to archaeologists, it is most likely a family tomb that is part of a large necropolis. 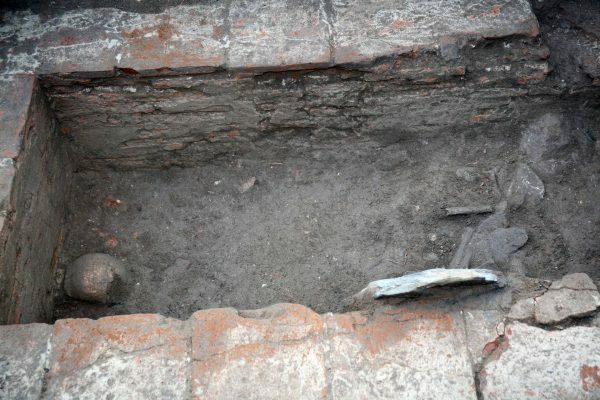 A statement on the website of the Medical University in Plovdiv said that the find had been examined by archaeologists Zdravka Korkutova from the University of Plovdiv and Associate Professor Georgi Tomov from the Medical University Plovdiv, who has a master’s degree in archaeology. According to them, the open space in the courtyard of the Medical University Plovdiv is a fully preserved one-chamber tomb made of bricks and mortar. It is covered with a granite block and is intact, which is a rarity. Within a few hours, specialists managed to reveal parts of the skull and lower limbs. Prof. Tomov said: “Probably the tomb is from the second to the third century and more than one person was buried there, that is, it is a family tomb. University rector Dr Stefan Kostyanev said that he hoped that the archaeological find will be part of the future museum of the University. In Roman times, Philippopolis had four necropolises, located around the main roads leading to and out of the city. The largest necropolis of Philippopolis was west of the city. It was developed at the end of the first century CE between the hills now known as Bunardjik and Djendem Tepe. During the flowering of the second century and the first half of the third century, the city expanded, and the necropolis grew increasingly westward, around the bottom of Dzhendem Tepe. People probably thought the site was sacred, for at the top of the hill was the Temple of Apollo Kendrisos. The graves and tombs also show how the economy of the city and of the empire has changed. The Western necropolis is a good example. During the prosperous second to third century, wealthy people were buried in expensive and well-built tombs of brick and mortar. In the uncertain fourth century, tombs became more modest and built from the remains of earlier buildings. Death reveals not only the lives of the cities, but also their inhabitants. One of them is the ethnic origin of the inhabitants of Philippopolis. The Thracians were usually cremated and buried in a mound. The bodies of the Greek and Italian settlers were laid under a tombstone, a stone sarcophagus or a tomb. Of course, with the time and the change in life, rituals have begun to change. Under the influence of Roman civilisation, the rich Thracians replaced tombstones with tombstones, sarcophagi and tombs.